Successful marketing of fresh fruits and vegetables depends on maintaining the quality through harvest and beyond. 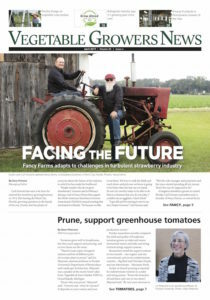 Marita Cantwell, postharvest specialist at the University of California, Davis, said in a presentation at the Mid-Atlantic Fruit & Vegetable Conference in Hershey, Pennsylvania, that the proper postharvest handling of vegetables to ensure quality and safety requires a multifaceted approach. “Fresh products are alive and respire,” Cantwell said. “Careful postharvest handling aims to reduce the rate of respiration and the rate of other processes that cause deterioration and quality loss that can include water loss, many biochemical changes, softening and other factors. “Careful, clean and efficient handling is more important than the sophistication of the postharvest equipment used,” she said. Cantwell said fresh fruits and vegetables can be associated with foodborne illness due to contamination and handling errors. “There is no kill step for fresh produce, so prevention of contamination is the focus of all good practices,” she said. “Preharvest and postharvest water use may spread human pathogens; if water is reused in postharvest operations, it needs to have a disinfectant to prevent cross contamination. Immature products have higher postharvest water loss and shrivel during marketing, she said. It’s important to harvest during the coolest part of the day, she said. To minimize the spread of disease, harvest should begin once the foliage has dried. Use clean harvest containers, cutting equipment and gloves. Keep harvested products out of the sun (use an empty container, shade cloth or other protection) to avoid direct sun injury and unnecessary heating of the product. Move the product quickly from the field. Injured areas on fresh produce lead to increased postharvest decay and water loss. Cuts, punctures, abrasions, crushing and bruising cause significant quality losses. In some cases, products may appear undamaged but may be bruised internally (melons). Reduce physical damage by reducing the number of steps in which the product is directly handled. Preparation for market often involves cleaning, trimming, washing and grading. The less brushing, washing and physical handling needed the better, she said. Cleaning may remove the surface waxes; waxing may then be needed to replace the product’s own natural protection. It’s important to avoid unnecessary drops, finger damage or abrasions. Do not over-pack or under-pack, Cantwell said. Cantwell advises sanitizing using 1 teaspoon of household bleach (5 percent solution of sodium hypochlorite) per 1 gallon of water. If using fiberboard cartons, remember that most of the stacking strength is at the corners of carton boxes; therefore stack and align cartons properly. Containers need vents (about 5 percent of the surface area) for airflow and efficient cooling. Use thin perforated plastic liners in carton boxes to reduce shrivel on products highly susceptible to water loss (delicate leafy greens, summer squash). Paper pads on the bottom and top of plastic-lined boxes will absorb excess drops of water and reduce decay. Although sealed plastic bags also reduce water loss, Cantwell said they are risky because they may cause an undesirable modified atmosphere, especially if the product is not held at a constant low temperature. A depletion of oxygen and buildup of carbon dioxide may occur in the sealed bag and result in off odors and other quality problems. If plastic bags or liners are used, it is best to cool the product before packaging. It’s important to cool the product as soon as possible after harvest. Mechanical refrigeration is the basis for most cooling methods, Cantwell noted. “Room cooling (placing products in a refrigerated room) is a relatively low cost, but also slow method,” she said. “The cold air needs to circulate around the product to remove heat, so leave space between boxes and between pallets. Hydrocooling (by submersion or spraying cold water) works for products that tolerate wetting and provides fast cooling and avoids water loss. Some products tolerate contact with ice; crushed or flaked ice can be applied directly or as ice-water slurry, Cantwell said. Evaporative cooling can be used in hot dry environments by pulling outside air through wet pads to provide high humidity and cooler air. Placing clean moistened sacks inside or over containers of packed product is a simple form of evaporative cooling. “This is a very important quality attribute,” Cantwell said. “Freshness is closely related to high visual, nutritional and sensory quality. Freshness can be achieved by expedited marketing, but can also be achieved by maintaining quality for short periods (days) under the proper conditions. “The longer the period from harvest to consumption, the greater the need for good temperature management. If products are stored for long periods (weeks), they need to be kept as close as possible to their ideal storage temperature to minimize quality loss. Once the product has been cooled, use low rates of air circulation to minimize water loss during storage, but sufficient to maintain uniform temperature. “Many vegetables and fruits (broccoli, lettuce, carrots, celery; apples, pears, peaches) require low storage temperatures. Other products (basil, cucumbers, eggplants, tomatoes, peppers, melons) are chilling sensitive and need to be stored at intermediate temperatures. Specific information about postharvest requirements for different fruits, vegetables and flowers can be found at the website of the UC Davis Postharvest Technology Center and in the USDA Agricultural Handbook 66. Cantwell reminded her audience ethylene is a natural gas produced by all products. “Many fruits produce high levels of ethylene and it is part of normal ripening (banana, mango, apple, pear, peach). However, leafy and root vegetables produce very, very little ethylene and are damaged by ethylene (russet spotting, bitterness in carrots, loss of leaves in cabbage, yellowing of leafy greens). Distribution with adequate transport vehicles is essential, Cantwell said. “In the field, secure the load to reduce vibration injury; drive slowly; cover the product to prevent exposure to the sun and excessive water loss,” she said. For transporting product to market, Cantwell suggested the use of an insulated truck if a refrigerated vehicle is not available. “Refrigerated trucks have sufficient refrigeration capacity but lack airflow capacity for cooling; they can only maintain product temperatures, so products need to be pre-cooled before transport,” she said. “Stack containers on pallets away from the truck walls and leave channels so cold air can flow around the containers.